You don’t need to bring any materials to the sessions as paint (water based acrylic), paper, screens, aprons and cleaning materials are all provided, it’s just bring yourself. If you have done a bit of printing in the past but feel a bit rusty then this could be a good refresher. 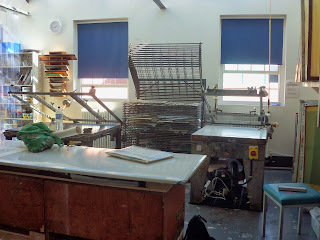 If you've never stepped inside a print room it's ok too! It’s a really friendly atmosphere and I’ll be covering all the basics with technical advice throughout each evening. If you have anything in particular you would like to print or ideas you would like to discuss then we can chat about that on the first session – it’s as much about what you’d like to learn too! You can be as creative and experimental as you wish… and ask any questions along the way. One of the aims is to enable you to feel confident enough to book the studio to use on your own after the completion of the course.